The Unloved, Part 30: "Torn Curtain" & "Topaz"
Alfred Hitchcock was my first auteur. My parents rented me all of his films from Blockbuster or the public library. I knew they were his because the VHS box art had his silhouette on the cover (which probably accounts for my collector's OCD, come to think of it). When my parents told me that he made cameo appearances in every film, I made a point of finding him in each one. He made me want to know more about how films were made. I loved his images, loved that the color of his movies didn't really look like anything else I'd seen before. Years later, the curator and writer Mark Polizzotti would tell me he discovered that he could tell a Hitchcock from any given scene. His images and rhythms speak to some secret part of the cinephile brain, it would seem. No one made pictures like Hitch. All the same I remember being utterly befuddled by 1969's "Topaz" after having made my way through most of his catalogue. "Psycho," "North By Northwest," "The Trouble With Harry"—those were crystal clear to me. But it turns out my third grade mind was not up to the task of deciphering just who or what "Topaz" was, or who these people were trying to divine its secrets. A small handful of images, like that of the death of Karin Dor's gorgeous, painted Cuban spy, stayed with me, but I could not understand why she was killed, or what the Castro lookalike with the gun was so put out about. Years passed and I learned I was hardly alone. "Topaz" had flopped and critics hadn't liked it at all. Reading about the controversial handling of the ending in Hitchcock/Truffaut in college got me wondering what on earth the master of suspense thought he was up to. Of course "Topaz" wasn't the only skeleton in Hitch's closet. He'd been on a losing streak that started with "Marnie" (now viewed by many as his best film) and continued with a film I always loved as a kid, "Torn Curtain." Rewatching "Torn Curtain," it's very easy to see what about the film made it both perfect viewing for a kid home sick from school and anathema to critics in love with "Vertigo." It's long winded, messy, and the leads suffer from reverse polarity for most of the movie. 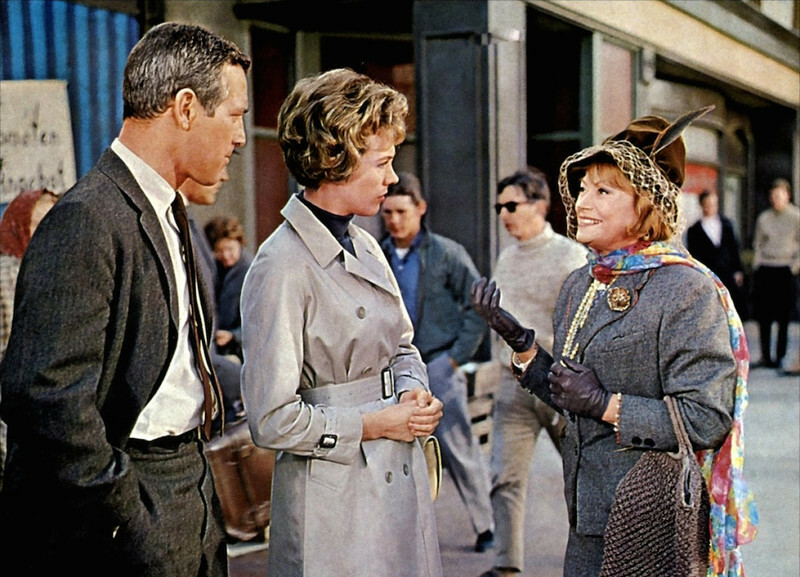 Julie Andrews and Paul Newman start in love, quickly drift apart, then reconnect with something like half of the movie left. It's only really engrossing if you know you have the whole day to waste watching their fluctuating chemistry eventually iron itself out. Had Hitch gotten lazy, or was he trying to catch up to a complicated world that didn't have a place for his old school romance and twisted sexuality? Looking at these films today, they present a compelling case that he was aware that world cinema had galloped into the future without him. Luis Buñuel, Ken Russell, Lindsay Anderson, Robert Bresson, Jean-Luc Godard, Bob Rafelson, Agnès Varda, John Frankenheimer, Mike Nichols and many, many more were smashing barriers every week. Hitch's tried and true methods of tension building and explosive release had lost a bit of their charm when cinema would show audiences anything it pleased. Was there a place for his slightly old fashioned experimentation? He gave it the old college try with "Torn Curtain" and "Topaz," and mostly his audience was unmoved. And yet there's absolutely something to these beguiling late-career works. They lack the immediacy of "Frenzy" and the jagged humour of "Family Plot," but they show a director who'd created thousands of people's ideal cinema, unafraid of looking ahead into an uncertain future. A future that may not have a place for him in it. Most people didn't accept Hitchcock's final handful of films, but years after his passing, they entranced, confused and entertained a kid just discovering the variegated pleasures and secrets of cinema. Hundreds of years from now Hitch will still be the first and best guide there is to understanding the language of film, and even dizzying oddities like "Torn Curtain" and "Topaz" will have their part to play. The Unloved - Torn Curtain & Topaz from Scout Tafoya on Vimeo.